Many businesses are turning toward integrated data center solutions to solve their white space management challenges. That's where the data center cabinet ecosystem comes in. By integrating the data center cabinet with hardware and software into a single platform, data center managers can truly gain visibility and understanding of the different dynamics within the data center to make informed decisions. Furthermore, the integration of IT infrastructure, hardware and software from the same manufacturer eliminates the challenges and confusion that result from pairing different products from different providers. 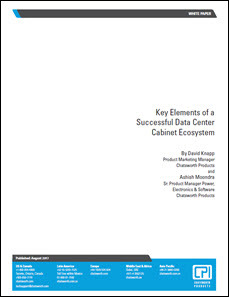 Download the report to learn more about what it takes to create a successful data center cabinet ecosystem.